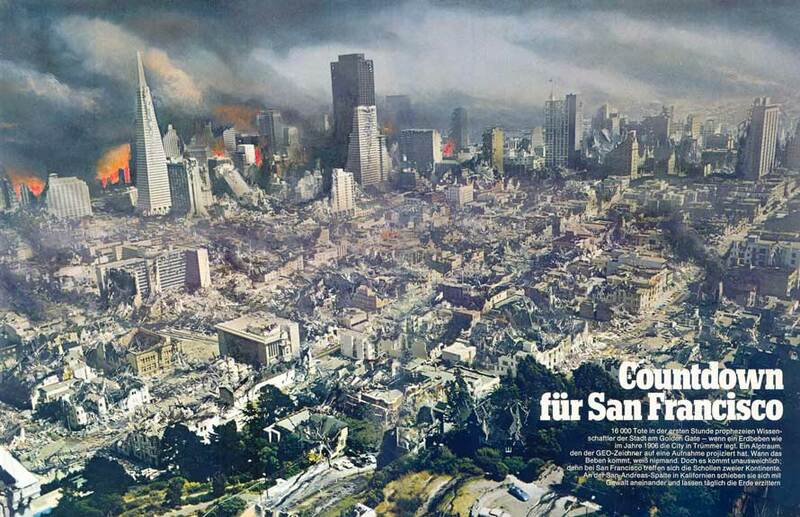 The illustration below is a depiction of the result of the next massive earthquake that will soon occur at San Francisco and the surrounding area. I created this page in response to the fact that a certain other page where I was showing this was getting a large number of hits from those inquiring about the next SF quake. See more in the way of explanation below. The story behind this illustration is a tad long. It begins with a certain Billy Meier who is often referred to on this website. I had originally placed this content on my "Billy and the Plejarens" page. I will give a very short explanation about Billy in the following paragraphs, but a continuing study of the incredible Billy Meier UFO case is high1y recommended. The name "Plejarens" is pronounced Play-YAR-an. Billy Meier is a man from Switzerland who was taken on many space-time trips in Plejaren Beamships (i.e., flying saucers). On one occasion when Billy was asked if he would like to go forward into time to see some future event. The event he picked was the next massive earthquake to hit San Francisco. Like so many things associated with Billy and the Plejarens, no exact date is provided on when this event will actually. This time travel trip was also one of the very few in which Billy was permitted to take photographs. There may have been eleven photographs taken. As it came about, the investigators who looked at these photo's were able to discern a way to tell the approximate time-frame of this event by the look of the cars. It is now considered by many that we are on the cusp of this event. Billy was not supposed to show other people these particular photographs, but the Plejarens must have known all along that he would not be able to overcome the temptation. Billy showed a photo (or a number of similar photos) depicted in the illustration above to the late Wendelle Stevens and some other investigators. This action later caused the Plejarens to destroy those particular photographs probably since it would have more of a direct impact on people as opposed to many of Billy's other very interesting photos. In any case, enough information was retained to be able to transmit what the photo looked like, and you can see the result above. I have no idea who the illustrator was. It was probably produced in the early 1990's. If you happen to have any further information on this illustration, then I would like to hear from you. The story on the next massive San Francisco earthquake is that it will be a 9.0 on the Richter scale for five minutes! No casualty figures were given to Billy, but you can well imagine it would have to be nothing less than massive! A figure of 16,000 dead is indicated as an initial figure, but I suspect the total long term figure would ultimately far higher. Of course, what happens in our reality is variable, especially depending upon what time of the day this will occur and other factors. This event can happen at ANYTIME now. My personal best intuitive guess would be anytime from 2015 to 2020, or maybe even later. My understanding on the larger Earth changes issue is that the more drastic of these will be from 2020 to 2025 where, for instance, California will by-and-large sink into the Pacific ocean! Be as that may, it doesn't take too much in the way of acumen to realize that the proverbial San Francisco "big one" has to occur sooner or later in any event as it sits directly upon a very active geological fault line!